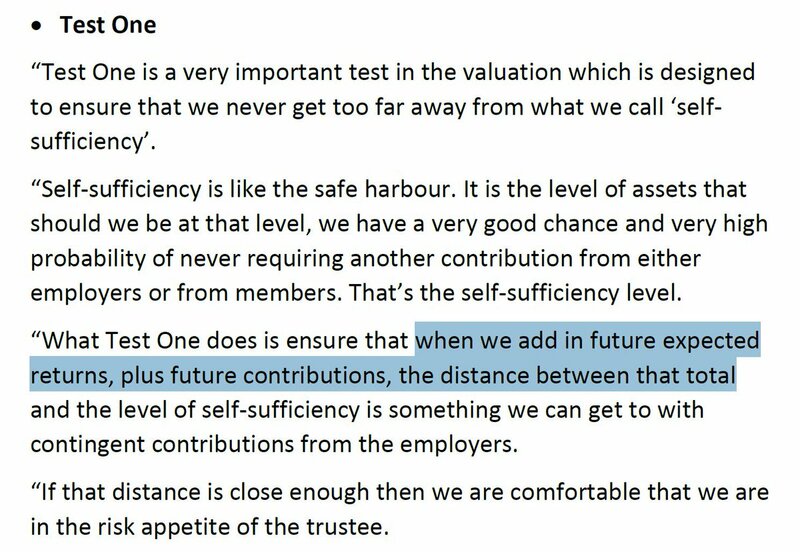 This from their response to Q4 is a bombshell in which #USS tries to shift some responsibility for the drive to de-risk onto @UniversitiesUK @USSEmployers 💣😯👀👇. I believe that #USS is referring to @UniversitiesUK @USSEmployers' failure to endorse the maximum growth in reliance on covenant as CPI+2% (general salary growth) that #USS proposed in its Feb 2017 valuation. See this blog👇. A new blog 👇entitled "On the significance of USS’s misrepresentation of tPR: It undermines the integrity of the consultation and USS’s case for an immediate shift to bonds". See this thread from yesterday👇for background. A significant & I think new statement from tPR, of relevance to #USS: "We do not assess the appropriateness of schemes' TPs or discount rates based on predetermined relationships to gilt yields or other indices." It appears, from this passage👇, that #USS's Test 1 & concern re short term reliance is grounded in pressure from tPR. #USS has just released a document on contingent contributions👇. I'm now reading it. Comments below when I've finished reading. (i) Increase in the technical provisions (TP) deficit above a certain level. This is the deficit with which we're familiar.